Daas Dev is yet another modern adaptation of Sarat Chandra Chattopadhyay's classic novel Devdas but with a twist. Set in Uttar Pradesh, the film is narrated by Chanda (Aditi Rao Hydari) and predominantly revolves around drug addict Dev (Rahul Bhat) who is the only heir of the political legacy left behind his father (Anurag Kashyap), the legacy that his Uncle (Saurabh Shukla) inherited upon his father's assassination. His aging Uncle is willing to hang his boots now but before that, he wants to hand over his empire to Dev. Dev is in love with his childhood friend Paro (Richa Chadda) and wants to marry him. But before marriage bells rings, the political atmosphere changes rapidly, leaving Dev clueless about which path to tread on and which to ignore. What happens next forms the crux of the story. Actor Rahul Bhat, who was last seen in Union Leader, plays the protagonist in Sudhir Mishra's Daas Dev. The actor gives his hundred percent to the movie and delivers a performance that is convincing and riveting. Richa Chadda also adds a lot to the film with her performance. She has got some terrific scenes in the film and nails them completely with her act. Aditi Rao Hydari is the lifeline of the movie. She looks so beautiful in her character that it's almost impossible to keep your eyes off her. She is the real star of the film who uses her eyes to convey the unsaid. After Padmaavat, she impresses with yet another impactful performance. Saurabh Shukla is in a terrific form. After receiving excellent reviews for his performance in Raj Kumar Gupta's Raid, the actor steals the thunder once again. He infuses new vim and vigor every time he comes on the screen. Other actors in the supporting cast also leave a mark. Sudhir Mishra returns to direction after his Chitrangada Singh and Arjun Rampal starrer Inkaar. While his last release had a corporate setup as its background, his latest offering has politics at the core of it. There is love, lust and greed involved in full measure. His direction is good as he successfully takes best out of his actors. The problem lies with the treatment. See, we have already seen so many versions of Devdas. What makes one version different than the other is its treatment, because the story is going to be more or less the same. That's where Daas Dev fails to score full marks. There is violence is every second scene. Writing is not up to the mark. The film looks intense and edgy, and the credit for the same goes to its cinematographer, Sachin K. Krishna. Editor Archit Damodar tries his best to keep the film crisp and pacey. He succeeds to a great extent. Having said that, the film could have easily been summed up within 2 hours. Talking about the background score, Daas Dev has great background score which gels well with the narrative. Sudhir Mishra’s films boast of good music that grows on you over time. Be it Hazaaron Khwaishein Aisi, Chameli or Khoya Khoya Chaand, music has always been one of the main highlight of his cinema. Here, in Daas Dev, he continues to complement his narrative with good music with the help of multiple composers, lyricists and singers. There are total seven tracks in the movie, some of them appear in the film while others don’t. But the ones which appear in the film don't flow seamlessly with the narrative. They appear and disappear anytime. Overall, the music of Daas Dev is just okay. Films based on Sarat Chandra Chattopadhyay's classic novel Devdas have always intrigued the audience and, interestingly, most of them have worked well at the ticket window. 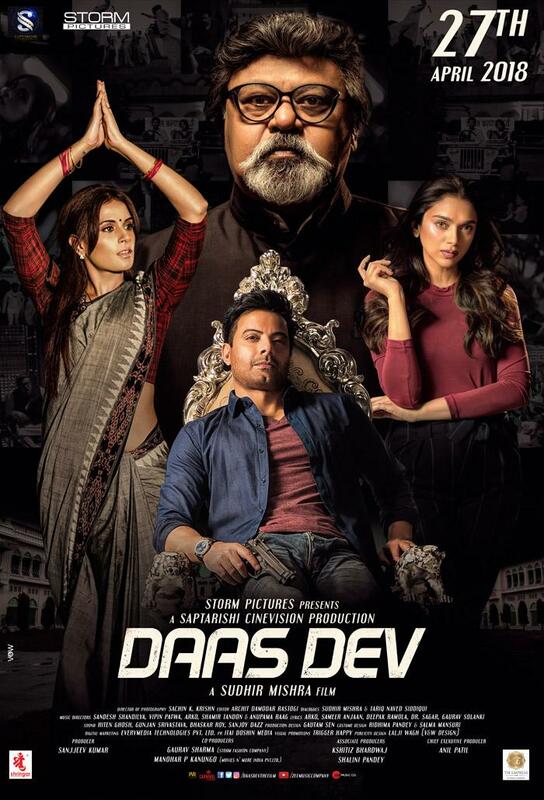 If you want to see Sudhir Mishra’s fresh take on the popular novel, you can watch Daas Dev. And that's about it. There is nothing special that you will see in the movie.